Recognizing that the Long Count’s 360-day year was 5 days short, the Maya devised another calendar called the Haab. To the eighteen 20-day months, they added a 5-day period called the Wayeb. These were considered to be days of uncertainty and bad luck when the portals between the mortal realm and the underworld dissolved and demons roamed the Earth. The stela on the right is a monument from the Maya city now known as Piedras Negras. It tells the story of a Maya queen named Lady K'atun Ajaw of Namaan. The inscriptions begin with an introductory glyph that flags to the reader that a date is coming. The glyphs that immediately follow are the long count dates and they show how many bak’tuns, k’atuns, tuns, winals, and k’ins have passed since the world began. These are followed by the specific day from the ritual Tzolk’in calendar. Next comes what is known as the supplementary series, which in this case includes one of nine night gods who ruled each day, as well as a cluster of glyphs to show the precise day within the lunar cycle. Last, the mason carves the day and month of the Haab calendar. In the sidebar you'll find a translation of the calendar glyphs that start this inscription. events took place in repeating cycles — “What has happened before will happen again,” as Lord 6-Rabbit puts it — and they developed a variety of astonishingly accurate calendars to track the movements of the sun and the stars. The Maya kings and priests used their elaborate calendar systems and their advanced knowledge of astronomy to help manage their kingdoms, to determine when to wage war, and to predict the future. The Long Count is the Maya calendar system that is probably closest to our own. Just as our Gregorian calendar counts the days and years from zero AD, the Maya counted from the day when they believed this world began. (Which, in our terms, was August 11, 3114 BC.) However, to make things a little more complicated, their year was only 360 days long. It is made up of eighteen months (or winal), each consisting of twenty days (or k’in). The Maya called this 360-day year a tun. Since they used a twenty-based counting system, their equivalent of our decade was a k’atun and it was twenty tuns long. Twenty k’atuns, or 400 tuns was called a bak’tun. This was equivalent to our century — though, of course, four times as long. problems, and thus bad for journeys or business deals. The number (1–13) determines how strong the characteristic would be. So on 13 Imix, you might want to stay home. The Calendar Round brings together the Haab with the Tzolk’in. It takes 18,980 days to work thought the 260 Tzolk’in days and the 365 Haab days. This is about fifty-two years. The Calendar Round is usually depicted as a series of interlocking cogs and wheels — which, in Middleworld, was the inspiration for the time machine in the Temple of Itzamna. The Maya carved stone monuments to mark key points in the histories of their cities, whether for the inauguration of new buildings, the celebration of victories, the accession of kings, or the marking of significant passages of time. They carefully recorded the precise dates of these events in the carvings. 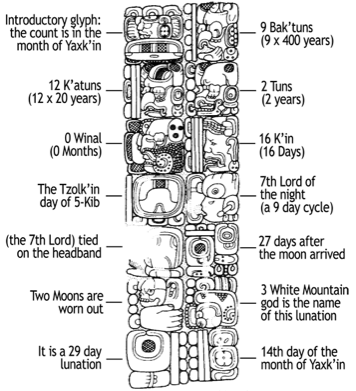 Given the lack of other written sources, learning to decipher the date glyphs on monuments is an essential part of a Maya archaeologist’s training. Calendar Tools: simple tool to convert our dates to the Maya Calendar.